The Dolphin Wave galvanized sailboat trailer features 78" cross arms with 10" rotatable carpeted bunks and rollers at each end. A bow stop aids in keeping the boat in place and a 60" mast stand holds the mast steady. This high quality trailer is the idea trailer for Hobie Wave catamaran sail boats. 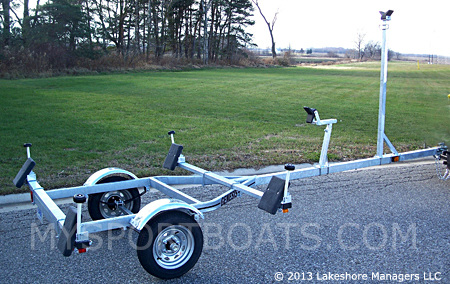 This sailboat trailer features an all welded steel frame and galvanized finish for yeas of service in both fresh water and salt water environments. The Dolphin Wave is not shippable and may only be picked up at the warehouse in Holland MI. Width Between Fenders (frame width): 42"
Free assembled pick up available in Holland MI. This trailer is built to order with a lead time of 7-10 business days.